Ewa Trębacz [pronounced Eva Trembatch] is a Polish-American composer living in Seattle. 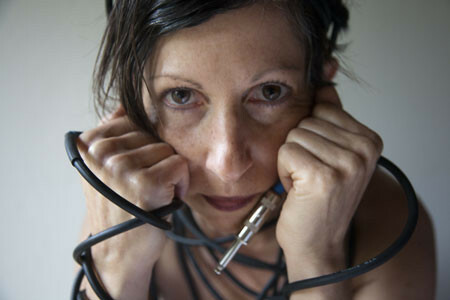 She holds Masters’ degree in Music Composition from the Kraków Academy of Music in Poland, and Ph.D. from the University of Washington Center for Digital Arts and Experimental Media (DXARTS), where she now works as a Research Scientist. Tonight she presents three works, two in collaboration with French horn player Josiah Boothby: Iriviskia (2015-2017) is an improvisational violin-horn duo with computer-realized sound; Anclsunr (2013) ANCLSUNR (2013) is a fixed-media version of a piece commissioned by the Polish Composers’ Union for the Polish Radio Symphony Orchestra, combining the original electronic layer with orchestral recordings from the rehearsals and the premiere in Warsaw, along with Ambisonic recordings from the Dan Harpole Cistern at Fort Worden State Park, and field recordings from Eastern Washington desert and Columbia River surroundings; Minotaur for live and pre-recorded horn improvisations and Ambisonic soundscapes gives Boothby an opportunity to fully demonstrate their virtuoso skills, requires both imagination and courage to freely approach the pre-composed material, and to create a unique conversation between the pre-recorded soundscapes and the performance space. Josiah Boothby is a versatile hornist devoted to new music, with a particular focus on improvisation and creative collaboration with composers and other artists. Josiah has performed as a soloist at the Warsaw Autumn Music Festival (2009), the New York City Electroacoustic Music Festival (2017), and has collaborated extensively with composers including Ewa Trębacz, Eyvind Kang, and Ahamefule Oluo. Principal hornist with the Seattle Modern Orchestra and fourth hornist in the Yakima Symphony, Josiah can also be heard playing with the Jim Knapp Jazz Orchestra, Seattle Chamber Brass, as well as on recordings with The Debaucherauntes, Dan Mangan, and Sunn O))).